Looking for a True Cloud Printing Solution? Ask these 10 questions. Like many organizations, you may be thinking about moving your traditional on premise infrastructure to the cloud. One of the key components that is often overlooked during the planning stage is printing. Not all cloud printing solutions are the same. Most aren't really True Cloud Printing solutions because they have on premise infrastructure dependencies and can't support cloud-based user authentication. 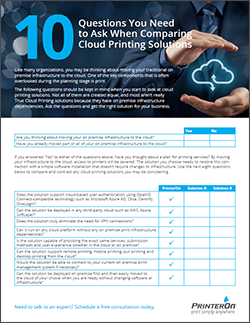 Take some time, ask the 10 questions and get the right cloud printing solution for your business. I would like to receive communications about PrinterOn products and services.